A tiny yard doesn’t have to be the death of outdoor fun. You can get the most from your small space by making some simple design changes. from a cramped and impractical environment to one that appears spacious and welcoming. One of the best tricks for enhancing a small space is to eliminate the straight lines. Most backyards are boxed in by fences, pathways or shrubs. You can alter the uniformity of these straight lines by adding shapes and curves to various points in your yard. Take a stroll around your backyard, or stand at one end to get a full view of the area you will be working with. Look for spots that have sharp edges or confining lines. As you observe your yard, you will get a feel for how well each area flows into the next. Once you spot the problem areas, you can make a variety of changes. Rearrange flower beds so your plants do not grow in straight lines. Instead, use creative patterns to give the illusion of space. Placing small stones in between the plants will create curves as well as provide eye-catching points of interest. To soften the edges in a corner of your yard, plant a small garden and surround it with a short, curved wall. 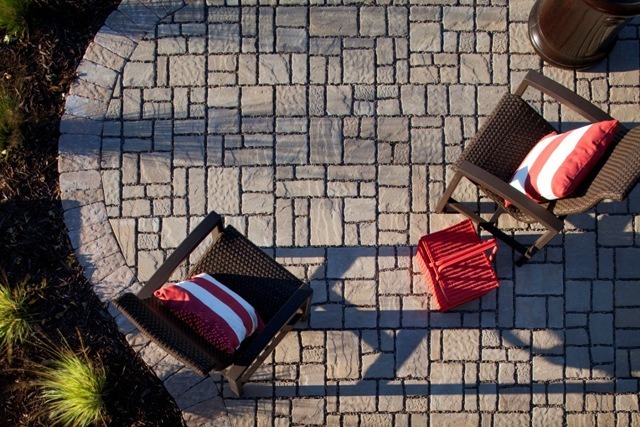 Use pavers to build the wall, and vary the sizes of the stones you use. This will trick the eyes into seeing a more open space. You can also construct small, curved pathways at various points in your yard. By adding a walkway, you will create the illusion of more room without actually losing any surface space. To make the most of your small backyard, you should include a significant amount of vegetation in your design. A yard without greenery is not only uninviting, it’s boring. Use corners and side yards to plant trees, bushes and flowers. Keep color in mind when you are selecting your plants, but don’t overdo things. Adding a splash of color here and there will create just enough visual interest without overwhelming the eyes. When planting any greenery in a tiny yard, use an assortment of sizes. Varying the heights of your plants will give dimension to the yard. Choose a diverse collection of foliage that will add color at different times of the year. To keep your backyard looking spacious, use flowers, shrubs and plants that grow low to the ground. At the far edges of the yard, you can plant tall, thin trees such as poplars, spruces or dogwoods. If you are extremely short on space, you can still construct a green oasis in your yard. Any strip of land can be turned into a garden. Take some time to tour your backyard and discover any hidden potential. You can plant beautiful flowers around decks, in front of patios, behind sheds or next to porch steps. If you don’t have enough space to grow a garden, you can use containers. Fill planters or hanging baskets with your favorite herbs or flowers. You can also use your fence to grow tomatoes, cucumbers or grapes. Regardless of how small your backyard is, it most likely has numerous useful features that get ignored. The key to using any hidden gems in your yard is to allow yourself to see them in new ways. A tree stump resting in the far corner of a yard makes a perfect seat for relaxing around a fire or viewing a garden. Turn a pile of rocks into an artistic focal piece, or use the rocks as stepping stones throughout your yard. Virtually any element in your yard can be elevated to a new, exciting level. Add accent lighting to dark, drab spaces, and use old lawn ornaments to give volume to an otherwise barren area. If you have always wanted a water feature but don’t have room for a fountain or large pond, you still have options. Place a water agitator in a birdbath to create unique rippling and bubbling effects, or turn a child’s plastic pool into a colorful fish pond. Your landscaping options are not limited simply because you have a small backyard. If you view your space as an empty canvas, the possibilities are endless. Highlighting the areas that are normally overlooked is a great way to begin the transformation. For more tips on how to get the most of your backyard space, contact Install It Direct. Sign up for a free estimate or join our mailing list, and you will soon be enjoying every inch of your backyard.